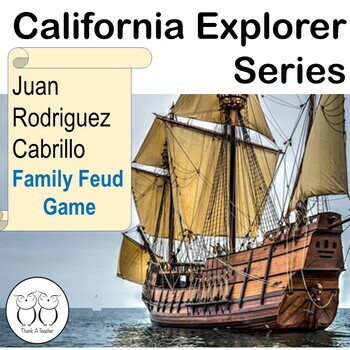 A fun Family Feud game that reviews explorer Juan Rodriquez Cabrillo's goals and accomplishments in exploring California. Even if students don't know the answers initially, they will learn as you play! My students were totally engaged and really enjoyed sharing their knowledge..
See our companion text Juan Rodriquez Cabrillo to teach the concept in a fun and engaging manner! This is a non-editable password protected file. If password window opens when file downloads click "Read Only". Open file and show in Slideshow mode, print answers before you play! Thank you to Not Just For Elementary for the Family Feud template. Follow us for more fun curriculum! •	Look for the green star next to my store logo and click it to become a follower. My store will be added to your email updates. 1. Go to your My Purchases page. Each purchase has a Provide Feedback button. Click it and give a quick rating and leave feedback. You earn credits to lower your costs and we really value your feedback!